There was hardly a dry eye in the house when the California Ballroom closed its doors for the last time. For it was farewell to the Cali when hundreds of people - young and old - packed the place for the New Year's Eve goodbye party. The Cali has been in business for the past twenty years, with stars like the Rolling Stones and PJ Proby providing first dates and first dances for thousands of teenagers. But now the ballroom in Dunstable will be taken apart brick by brick, to make way for a housing estate - much to the relief of local families who have been complaining for years about noise and vandalism. The New Year's party did not feature any giants from the pop world, but top BBC disc jockey Robbie Vincent joined other local DJs to make it a night to remember. Robbie said "I had another gig in London to go to, but I just had to be at the Cali for the last night. Instead of selling the kids tickets, it should have been paper hankies - it was one of those nights." One of the first at the last fling at the Cali was thirty-six year-old Richard Littlejohn who had made the long trek from Islington to be there. He said "I last came here when the Stones played. It was in 1964, when they were top of the charts. I never went back until the last night, but it was then all those years ago, that I met my wife Wendy, and we went back for a bit of a reunion." Another party-goer, Annette Gartland, aged 25, of Dunstable Road, Luton, added: "Now that the Cali is shut, none of the youngsters round here will have anywhere to go. The last night was really fantastic and there were plenty of people in tears when it came to go." Mark McCall, aged 17, of Ashcroft Road, Stopsley, Luton, said "I had only been to the Cali a few times but there was quite an atmosphere - I've never known anything like it before." It was in March 1960 that the Cali first opened its doors, with the stars virtually queuing up to play. 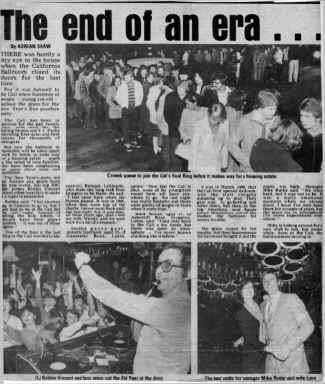 They gave way to go-karting and roller disco, but then, as the top American soul bands priced themselves out of the market, the ballroom hit money trouble. The place closed for ten months, but then businessman Bill Seymour bought it and the music was back. Manager Mike Rutter said: "We tried hard, but it was not to be. It was a really emotional moment when we closed down. I know I've only been there for a couple of years, but the place has an atmosphere I've never experienced elsewhere."